Looking for a job? Do you like talking about bikes and are good in sales? 180 Distribution is looking for a Inside Sales Rep at their warehouse in California for Volume Bikes and Demolition Parts sales. If you are looking for that sort of work, get the full scoop below! “Looking for a job in BMX and like to talk on the phone, good with people, knowledgeable on bmx products, live in SoCal, and have a good work ethic? We’re now hiring a new sales rep at our Whittier, CA office. Here’s a video Vans Bicycle Center put together from the jam they threw when the 180 Distribution crew rolled through. Hit play to check out what Matt Cordova, Mike “Hucker” Clark, Kris Fox, Broc Raiford, Demarcus Paul and some of the locals got into during the session! “180 Distribution Nor Cal Shop Stop Tour with Demolition Parts and Volume Bikes at Vans Bicycle Center, Yuba City, California. Huge thanks to everyone who came out and made this jam what it was! Ride BMX dropped the 2nd video in their “Company Property” series for your viewing pleasure. The second video takes us to 180 Distribution (Home of Volume Bikes) for a session with Broc Raiford, Gary Young, Stevie Churchill, Caleb Quanbeck, Connor Lodes, Josh Clemens, Travis Hughes, Sean Ricany and Demarcus Paul! You already know there’s a ton of great riding in this BMX video. “Company Property involves a trifecta of ramp setups (TIP, Full Factory, and 180 Distro) and three camps of riders, all seasoning together over the course of two days. 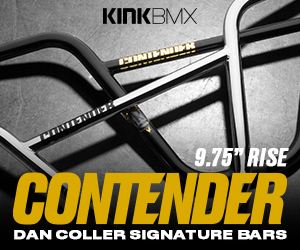 No competition, no prize to win, just raw BMX that’s the product of 9 hand-picked riders (3 from each camp). This is the 180 Distro session. The guys over at 180 Distribution, the home of Volume Bikes and Demolition Parts, have let us know that they have moved their warehouse to a new location in Anaheim, California! If you’re a shop in the United States looking to get your hands on Volume and Demolition BMX products, they have a new number and address! Get the full details below! It’s that time of the year when brands are starting to finally release their latest and greatest products that we got a sneak peek look at during Interbike 2013 back in September. If you recall our coverage from the event, Volume Bikes and Demolition had a handful of new product on display that was looking nothing short of dialed. With their new product just about ready to hit distributors, shops and mail-orders world wide, we decided to chase down Brian Castillo to get photos and all the specs on all of the new product him and the rest of the crew have been hard at work on for the past year or so. We are fortunate enough to give you guys the first in-depth look at their full range of new frames and parts that we undoubtably know you guys will be stoked on. Let’s take a closer look! Saturday already? Thanksgiving really threw me off this week! Either way, it’s that time of the week again! This week we’re going to take a look at the Flip hub from Stolen Bikes, the Doomwizard frame from Mutiny Bikes, the Elite fork from Demolition, David Grant’s signature Raider bars from BSD and then we’ll wrap things up with the Street Digger tires from Subrosa. Ready? Let’s do this! Are you looking to get a job in the BMX industry? How sick would it be to work for Brian Castillo from Volume and Demolition? Well, here’s your chance. 180 Distribution is now hiring for a full-time sales rep! You can find out more below! “Description: 180 Distribution, home of Volume Bikes and Demolition Parts are now accepting applications for a full-time inside domestic sales rep position. Location: Santa Fe Springs, CA. Experience: Retail or wholesale. Bicycle industry or bike shop experience is helpful. Salary/ Benefits: Competitive starting salary plus commission. Health insurance benefits offered after 90 days.